Dylan James Manning (commonly referred to as "DJ") was born on Thanksgiving Day, November 22, 2001. Dylan's arrival was a long awaited event for his parents, Brian and Sherri of Atglen, Pennsylvania. Although Dylan was anxious to arrive almost four weeks early, he was not quick to reach his milestones. Doctors naturally gave him a little extra time to reach things like crawling and rolling over due to his prematurity. But it didn't take long to figure out that something serious was wrong with Dylan after he started gagging on his liquids and could not hold a pacifier in his mouth. He was not able to support his own weight when standing and was not making eye contact anymore. Even though his doctors insisted that he was fine and perhaps he had some developmental delay, they ordered an MRI after his parents requested it. This showed only a reduced corpus collosum and demyelination. Children could function totally normal with both of these conditions and it was nothing to worry about, a mild cerebral palsy was the diagnosis we received to generate home based therapy for Dylan. The Mannings knew this could not be all that was wrong because he was not showing signs of improvement after intense therapy. So, they proceeded to take Dylan to an Opthamologist for further evaluation on his eye sight. This eye doctor detected what three neurologists could not determine, Dylan was diagnosed with Tay-Sachs Disease at 17 months of age. A cherry red spot on his retina was an indicator of this outcome even though his parents were not of Jewish descent. Because the doctors were not so sure this could be it since we were not characteristic carriers, they insisted that they speak to our neurologist before concluding anything and didn't explain what Tay-Sachs was or resulted in, only that it was a metabolic disorder that caused fatty storage. This made complete sense! With a different diet, Dylan would gain strength and have enough energy to begin functioning the way children his age normally should...and so, we celebrated...at least, until I got home and went to the Internet for help! That day changed our lives forever!! A part of us died with Dylan on the day he was diagnosed, March 27, 2003. We will never forget it for as long as we live. How could this be? This was our only child and our special angel that we worked so hard for (1 of 4 pregnancies). Could God be that cruel to take him away from us and to make him suffer the pain we knew he would have to endure? How can there not be a cure for this disease we had never heard of that is killing children and we are sending astronauts to the moon? Is something not right with the world? We are still trying to figure that out. We attended our first Tay-Sachs Conference sponsored by the National Tay-Sachs And Allied Diseases Association two weeks later and I must say that we are probably still in a state of shock. I quit my job immediately and parents from Dylan's daycare decided to start raising money for his needs just to find some way to help us cope. This was just the beginning, it was a bake sale here, collection cans there but then Brian and I began to realize that we needed to do more! We established a non-profit foundation to raise much needed funds for a cure and to spread awareness about this fatal disease that marked Dylan's days. We didn't know where or when God would come to take our Angel from us, but what we did know for sure was that we would treasure every second with him and treat every day as if it were his last. One quote I have grown to really appreciate...Life is not measured by the number of breaths you take, it is measured by the moments that take your breath away! This is something the world should live by. You begin to look at life much differently and don't take anything for granted. You LIVE FOR THE MOMENT! Thanks be to God, we gave birth to a healthy baby boy on April 18, 2005 through Invitro-Fertilization (IVF) and Pre-Genetic Implantation Diagnosis (PGD). Brady Dylan Manning is now two years old and he is our gift from God. He gives us a reason to live and asks about his brother every day. We will treasure every family photo we have which included both of our boys and we still struggle with ways to sign Christmas and birthday cards, or to leave messages without mentioning that Dylan is still a part of our family. We want people to know that he existed and still lives in our hearts! 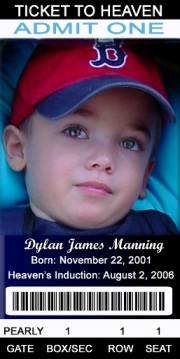 Dylan lost his battle to Tay-Sachs Disease on August 2, 2006. It was a Wednesday afternoon on a hot summer day after we took him to watch the sunrise and have a nice breakfast in town. He died in my arms while I was giving him a bath to soothe his pain. I will treasure the moment that he met God for the rest of my life. His daddy was right by our side and the second we knew we lost him, we both broke down in anguish until the most beautiful moment happened...Dylan gave us the most beautiful smile and then, he took his last breath...that's when he met God! He was surrounded by his entire family and loved by people around the world. Dylan taught us so much without ever saying a single word, that is, until the day he died...he said, "Ouch"! He summed his past few years up in that one statement. Although, we are quite certain that he may have uttered another word before then...that word was "GOD" and then, at least I would like to think, he said, "Mama." 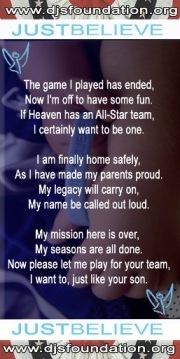 If your angel suffers from Tay-Sachs, please feel free to reach us through Dylan's website at www.djsfoundation.org. If you are doing research on TSD, we would be happy to send you educational materials for your project. And lastly, if you are looking to donate money to CURE TAY-SACHS, please do...WE NEED YOUR HELP! A CURE IS WITHIN REACH!